Taken with Apple iPhone 3GS phone camera August 25th 2012. 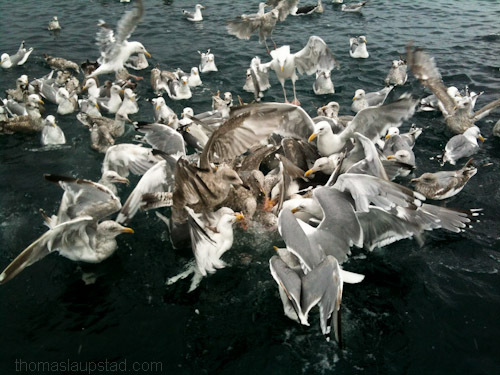 Here I have photographed some seagulls when I was out fishing last month in Northern Norway. There is always some seagulls around your boat when you are out on the sea, just waiting for you to throw them some goodies. 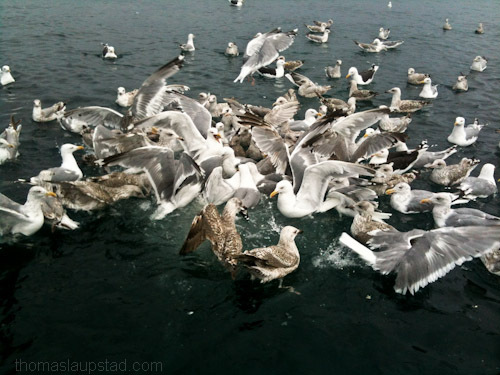 On this trip we caught a lot of fish so we had to do some gutting and these seagulls love fish guts. After a while more and more seagulls arrive at the scene and it becomes quite crowded around the boat as you can see in the pictures. There were mostly European Herring Gulls (Larus argentatus) around the boat, but also some larger Great Black-backed gulls (Larus marinus). The seagulls come really close to the boat and some even took guts from my hand. Here is another picture from the feeding frenzy. Please see my other pictures of seagulls here. Taken with Apple iPhone 3GS phone camera July 10th 2012. Click image for larger view. Walking home from work I came across this colorful moth laying on the street. I have seen a moth like this before so I had to do some researching to figure out what kind it was. Unfortunately the moth was dead, but I was able to get a picture of it with my phone. 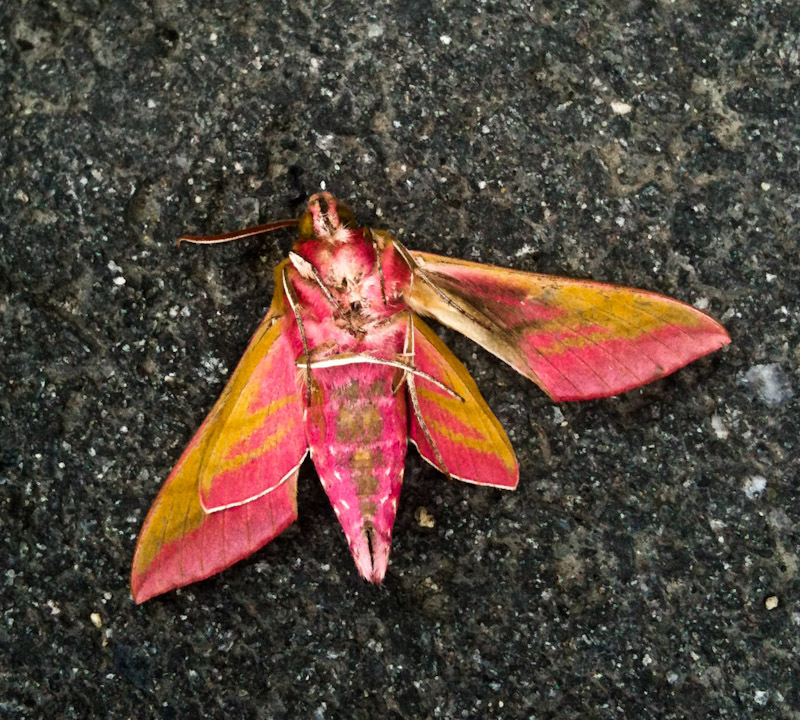 After a while I found the moth to be a Elephant Hawk-moth (Deilephila elpenor), an insect in the Sphingidae family. The moth is pretty large and has a fabulous coloring which you can see in the photo (click the picture to view the moth in large format). This moth is lives all over the southern parts of Norway, but it is also believed to be spreading further north. The moth can be found in most parts of Europe and also in Asia. Please check out my other insect pictures here. Taken with Olympus EPL-1 digital camera August 12th 2010. Click image for larger view. 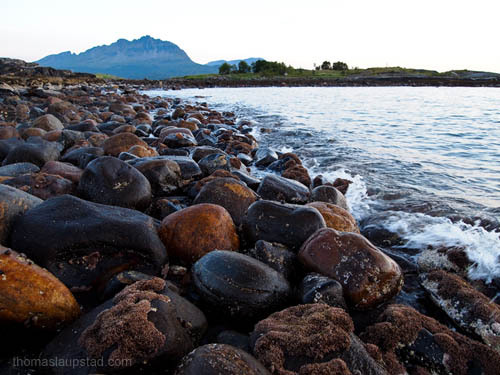 Here is a picture that I photographed on a trip to Northern Norway. The tide was very low that day and this uncovered some rocks that usually is covered by the sea water. As you can see (click on the picture to view the large sizer version) there was some really interesting rocks and some kind of coral growing on the rocks that you do not usually see. The mountain in the background is called Drangen and is a part of our neighbor island, Rolla. Please see my other pictures from the Norwegian coast here. Taken with Olympus E500 digital camera August 8th 2009. Click image for larger view. I came across this ladybug (or ladybird as it is known in some parts of the world) (Coccinellidae) while I was out photographing. As I looked closer I noticed that the beetle was hunting some plant lice. 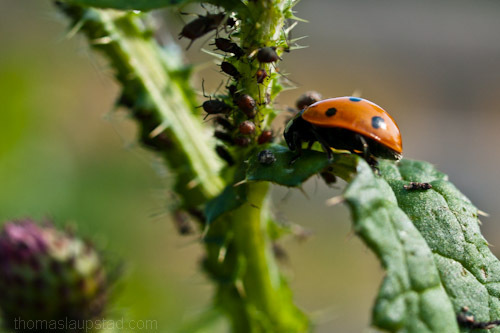 The lice was feeding on a burdock plant so the plant was probably happy that this ladybug flew by. I have uploaded an extra large version of this picture so please click it to see a larger version where you can see more details. We have 54 different species of ladybugs in Norway and I’m not completely certain what kind this is as I forgot to count the number of spots on its back. Many of the species feed on plant lice like the ones photographed here, and they are important to keep plant lice in check so their numbers do not get out of control.